Recorded tapes can be moved to a vault. In the vault, you can view tape information, including data written to tape and data retention settings. If the tapes are placed to a vault, you can still view them under the Offline node or in the media pool. 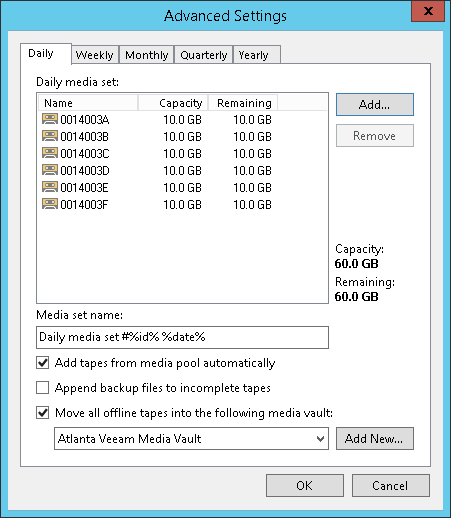 You can move the tapes manually or instruct the relevant media pool to place the tapes to a vault automatically. Navigate to the list of tapes either under the Media Pools or under the Libraries > LibraryName node > Media > Offline. In the working area, right-click the tapes you want to move and select Move to Vault. Choose the vault you need. Select the media pool you want to customize. Click Edit Media Pool on the ribbon. Alternatively, you can right-click the media pool and select Properties. Go to the Retention step of the Edit Media Pool wizard. 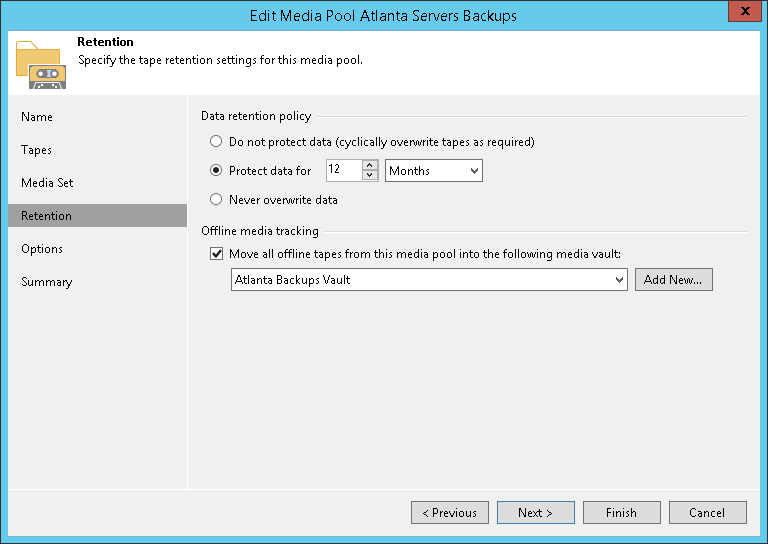 In the Offline media tracking field, select Move all offline tapes from this media pool into the following media vault. Select the needed vault from the drop-down list. Note that moving tapes to a vault automatically will not be available if you select Do not protect data (cyclically overwrite tapes as required) option as a data retention policy. If you have not previously created a vault, you can click the Add New button and create a new vault without closing the job wizard. For more details, see Creating Vaults. Navigate to the Media Pools node. Select the GFS media pool you want to customize. Go to the GFS Media Set step of the Edit Media Pool wizard and click Advanced. Select a tab with the needed media set and select Move all offline tapes into the following media vault. Select the needed vault from the drop-down list.